Cream is the fat that rises to the top of whole milk. It has a smooth, satiny texture and is labeled according to its butterfat content (heavy to light). Creams are usually labeled "pasteurized" or "ultra-pasteurized". Ultra pasteurized creams have a longer shelf life than pasteurized creams, but taste is affected (some say it has a cooked flavor). For superior taste, although it can be hard to find, buy 'pasteurized' not 'ultra pasteurized' cream. Heavy Cream or Heavy "Whipping" Cream has 36 - 40% butterfat and when whipped it holds its form and doubles in volume. Heavy cream is used for filling and decorating pastries. Whipping Cream has a butterfat content of 30%. It whips but not as well as heavy cream, and will not hold its form long. Good for fillings but does not hold up well for piping. Light or Coffee Cream has 18-30% butterfat. Half and Half Cream is a mixture of cream and whole milk and contains 10 - 18% butterfat. Mainly used in beverages and does not whip. Single Cream has a 20% butterfat content and is used in both sweet and savory cooking. Double (rich) Cream has a 48% butterfat content and can be whipped and is also used in pies and sauces. Clotted Cream (Devonshire or Devon Cream) is a thick, rich, yellowish cream with a scalded or cooked flavor that is made by heating unpasteurized milk until a thick layer of cream sits on top. The milk is cooled and the layer of cream is skimmed off. Clotted cream has 55-60 percent fat content and is so thick it does not need whipping. Traditionally served with scones and fruit. Clotted cream is produced commercially in Devon, Cornwall, and Somerset England. In the States it is sold in small jars and can be found in specialty food stores or else through mail order catalogs (The Baker's Catalogue 1-800-827-6836 or kingarthurflour.com). Creme Fraiche is pronounced 'krem fresh'. It is a thick and smooth heavy cream with a wonderfully rich and velvety texture. This matured cream has a nutty, slightly sour taste produced by culturing pasteurized cream with a special bacteria. (However, in France, where it originated, the cream is unpasteurized so it naturally contains the bacteria necessary to make creme Fraiche .) The butterfat content varies (usually 30%), as there is no set standard so you will find every brand tastes a little different. Creme Fraiche can be found in specialty food stores and some grocery stores although it is quite expensive. To make your own, simply combine 1-cup (240 ml) heavy cream (preferably pasteurized, as ultra pasteurized will take much longer to thicken and will not taste as good) with 1-tablespoon buttermilk. Warm the cream to about 105 degrees F (40 degrees C). Remove from heat and add the buttermilk. Allow the mixture to stand in a warm place, loosely covered, until thickened but still pourable. This can take anywhere from 8 to 36 hours, but taste every 6 hours. The creme fraiche is ready when it is thick with a slightly nutty sour taste. Refrigerate. Will keep up to a week in the refrigerator. Creme Fraiche is used in both sweet and savory dishes. 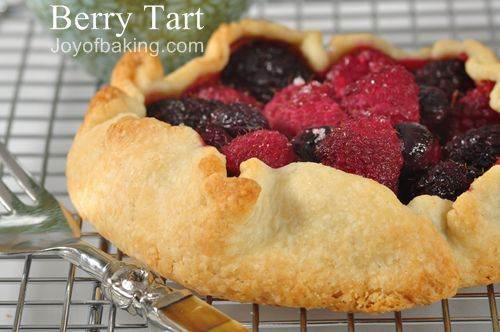 Makes a wonderful topping for fresh berries, cobblers and puddings. To Whip Cream: Make sure the cream is cold and chill bowl and beaters or whisk in the refrigerator for one hour, or in the freezer for 15 minutes. Beat cream at medium speed until cream starts to thicken. For soft peaks continue to beat until the cream, when beater is raised, droops slightly from the ends of the beater. For stiff peaks beat cream until the cream holds its shape and clings to the end of the beater when raised. If the cream is beaten too long it becomes grainy. Note: When a recipe calls for whipping cream I always use heavy whipping cream. It is richer in taste and makes a better tasting product. If possible, use pasteurized as it has a better taste than ultra pasteurized. The one place that I always use ultra-pasteurized cream is when making ganache because it produces less air bubbles in the chocolate. Note: When whipped cream is lightly sweetened with sugar and flavored with vanilla extract it becomes Cr?e Chantilly (pronounced shan-TIHL-lee).